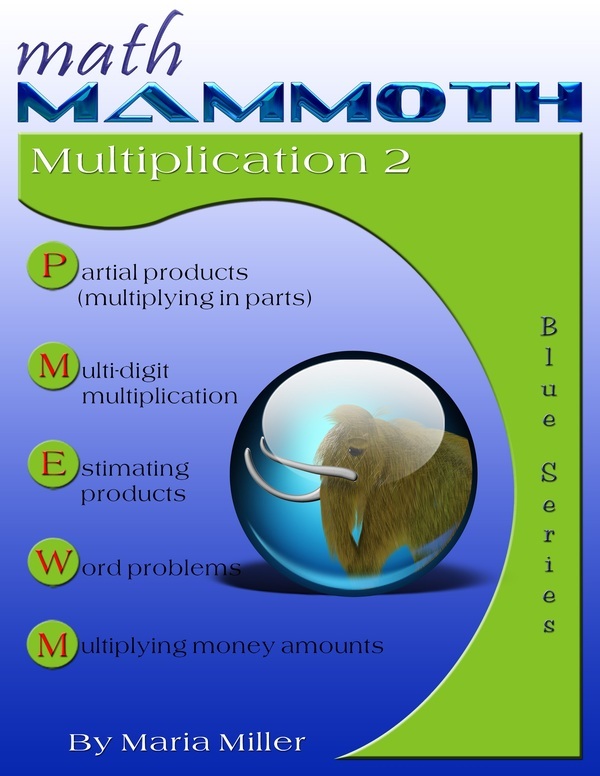 Math Mammoth Multiplication 2: multi-digit multiplication. Self-teaching worktext. Math Mammoth Multiplication 2 is a continuation from Math Mammoth Multiplication 1. It covers multi-digit multiplication and related topics, and suits best fourth grade mathematics. The first lessons briefly review the multiplication concept and the times tables. The next lesson, where students solve scales or pan balance problems, is intended to be somewhat fun and motivational. The balance problems are actually equations in disguise. Then, the focus is on multi-digit multiplication (also called the algorithm of multiplication, or multiplying in columns). We start out by multiplying by whole tens and hundreds (such as 20 × 4 or 500 × 6). After this is mastered, we study a very important concept of multiplying in parts (also called partial products algorithm). It means that 4 × 63 is done in two parts: 4 × 60 and 4 × 3, and the results are added. This principle underlies all other multiplication algorithms, so it is important to master it. We do not want children to learn the multiplication algorithm blindly, without understanding what is going on with it. Multiplying in parts is also tied in with an area model, which, again, is very important to understand. Before showing the traditional form of multiplication, the lesson Multiply in Columns—the Easy Way shows a simplified form of the same, which is essentially just multiplying in parts. You may skip that lesson at your discretion or skim through it quickly if your child is ready to understand the standard form of the algorithm, which is taught next. Students also study estimation, the order of operations, and multiplying with money. Many kinds of word problems abound in all of the lessons. Students are supposed to practice writing a number sentence for the word problems—essentially writing down the calculating they are doing. The lesson So Many of the Same Thing could be entitled "Proportional Reasoning" but I wanted to avoid scaring parents and children with such a high-sounding phrase. The idea in that lesson is really simple, but it does prepare for proportions as they are taught in 7th grade and in algebra. After that, we multiply two-digit numbers by two-digit numbers. Again, we first study partial products and tie that in with an area model. The lesson Multiplying in Parts: Another Way is optional. The books ends with the standard algorithm for multiplying a two-digit number by a two-digit number. Math Mammoth Division 2—a worktext about long division, word problems, average, and divisibility (grades 4-5).